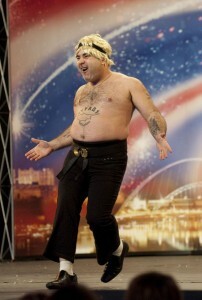 Demetri Demetriou, who works for an Ealing based construction firm, is facing a showdown with SuBo after winning the public vote on the latest episode of Britain's Got Talent. Along with his 12 year-old son Lagi as the Greek-Irish dancing duo ‘Stavros Flatley’ they have won the admiration of Amanda Holden, Piers Morgan and even Simon Cowell with their interpretation of Riverdance. They now have to defeat hot favourite Susan Boyle to be the overall winner. Despite his national profile, Mr. Demetriou continues to work for the Kier Group which provides property maintenance services but he admits that he is gaining a bit of celebrity. He said: “Since the show was broadcast I am being recognised by tenants and they always say they think our act was great. Mr Demetriou has worked at Kier for eight years and carries out electrical repair and maintenance projects for Ealing Council.